Here is a review of Frank Brady's book Endgame by a person who is not a chess player. Blogger Mark Weeks warns us to get ready for a Bobby Fischer media blitz. On April 9, 2011, international master Dean Ippolito will attempt to set a professional world record in a new category created by Guinness for simultaneous exhibitions, requiring all players to have USCF or FIDE ratings between 1200 and 1800. 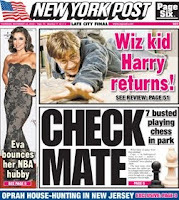 On Tuesday, charges were dismissed against five of the Inwood Hill Park chess players. Two other players opted for civil trials next week. Earlier this month, seven-year-old fraternal triplets from East Windsor won the first-grade section at the national scholastics. Today I won this game in the Empire City Open. 26.Qc3 Ne8 27.Kc1 Rc8 28.Qa3 Rxc2+ 29.Kd1 Rgc7 30.Ke1 Re7+ 31.Kd1 Rc4 32.Be2 Rd4+ 33.Ke1 Rde4 34.Qxa6 Rxe2+ 35.Kf1 Rxb2 36.h3 Bd3+ 37.Kg1 Ree2 38.Qc8 Rxg2+ 39.Kh1 Rh2+ 40.Kg1 Rbg2#. Earlier today, I drew this game in the Empire City Open at the New Yorker Hotel. 36.Be2 Nc5+ 37.Ke3 Kc3 38.Bb5 Ne6 39.g3 Nd4 40.Ba4 Nc2+ 41.Bxc2 Kxc2 42.h4 Kd1 43.f4 f6 44.fxe5 fxe5 45.Kd3 Ke1 46.Kc4 Kf2 47.Kd5 Kxg3 48.Kxe5 Kxh4 49.Kd6 g5 50.e5 g4 51.e6 g3 52.e7 g2 53.e8=Q g1=Q 54.Qe7+, draw. The holiday season has given me the time to read the uncorrected proof of Endgame: Bobby Fischer's Remarkable Rise and Fall - from America's Brightest Prodigy to the Edge of Madness by Frank Frady, the definitive book on the life of Bobby Fischer. Endgame is a page turner, like a detective novel except the mystery never gets solved because Fischer's life is stranger than fiction. If you read Endgame, you will find everything you wanted to know about Fischer's enigmatic life, and a few things you really didn't! I learned that, when his older sister Joan bought their first chess set, Bobby was living in Manhattan because the family had not yet moved to Brooklyn. And, until reading Endgame, I had never realized how upset Fischer became after losing to Mikhail Tal at the 1959 candidates tournament. For me, the most memorable scene occurs when Fischer and Brady are dining at the same Greenwich Village restaurant as Jackson Pollock and Andy Warhol. What little humor there is takes place on Bobby Fischer Day in 1972 when Fischer says to the audience, "It is not true that Henry Kissinger phoned me during the night to tell me the moves." IM Jeremy Silman summarizes Endgame well when he writes, "Fischer is America's greatest antihero. This fascinating biography is filled with hope, Cold War intrigue, the fulfillment of genius, and an explosive fall from grace that is both deeply moving and, ultimately, profoundly sad." I will add that Endgame is more than the story of an eccentric genius. It is a commentary on the sorry world that we live in, which treated the Mozart of chess so disrespectfully. Blogger Blue Devil Knight is holding a Carnival of Chess Improvement, scheduled for January 3rd. Gutierrez - West @ "Contre Gambit Philidor"
Frederic Fournier provides a link, at Contre Gambit Philidor, to my game as Black against Michael Gutierrez. 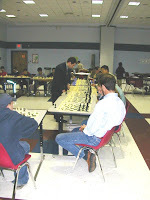 These photos were snapped by me on Sunday at the Marshall Chess Club. You will see candidate master Nick Conticello, international master Renato Naranja, and FIDE master Asa Hoffmann, as well as the final round game between Ed Kopiecki and Jason Margiotta. Filmmaker Katie Dellamaggiore has found a name for her untitled Chess Movie, a documentary about the chess program at Intermediate School 318. 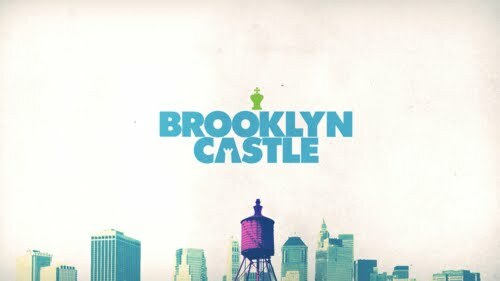 The title is Brooklyn Castle. Yesterday I drew this game in the Marshall December Grand Prix tournament at the Marshall Chess Club. 27.Re3 Kf7 28.c3 Be6 29.cxb4 Bxb4 30.a3 Bd6 31.h3 Bd5 32.Kf2 Bf4 33.Rd3 Ke6 34.Be3 Ne5 35.Rc3 Bxe3+ 36.Rxe3 Kd6 37.b4 Nc4 38.Rg3 g6 39.h4 Be4 40.a4 Bc6 41.h5 Ne5 42.hxg6 hxg6 43.b5 axb5 44.axb5 Bxb5 45.Ke3, draw. On Saturday, I won this game in the Marshall December Grand Prix event at the Marshall Chess Club. 31.Rd1+ Ke6 32.Rd2 Rxc3 33.Rd6+ cxd6 34.Bxc3 d5 35.Kf2 d4 36.Bb2 Kd5 37.g4 e4 38.fxe4+ Kxe4 39.a4 Nb4 40.Ba3 Nd3+ 41.Ke2 Nf4+ 42.Kd2 Nxh3 43.Bf8 Nf4 44.Bxh6 Ne6 45.Ke2 b5 46.axb5 axb5 47.a3 Kf4 48.Kd3 Kxg4, White resigns. During Sunday's ICA Early Winter 2010 Open in Hackensack, I snapped these photos. The Sparta Chess Club is opening its ninth season. Teams from the Sparta schools have scored well in recent scholastic tournaments. 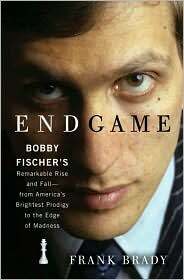 Here is an excerpt from Dr. Frank Brady's soon-to-be-released book Endgame: Bobby Fischer's Remarkable Rise and Fall - from America's Brightest Prodigy to the Edge of Madness. Did Bobby Fischer suffer from a genetically predisposed paranoid personality disorder? The Marshall Chess Club presents a simultaneous exhibition with senior master Yaacov Norowitz. 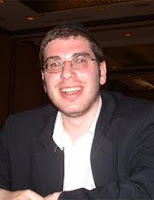 With a USCF rating of 2550, senior master Yaacov Norowitz is America’s strongest chess player without an international title. His highly original style has also made him one of the world’s strongest blitz players with an ICC rating of 3400+. Yaacov will exhibit his talent at the Marshall Chess Club by taking on up to 50 players simultaneously. Come join us for a fun and exciting evening of chess and a chance to win a free Marshall Chess Club membership! One year Marshall Chess Club membership for a win! Six month Marshall Chess Club membership for a draw! Trophies and three month Marshall Chess Club memberships for the last player and the last junior under the age of 18 to finish! Yesterday I won this game at the ICA Early Winter 2010 Open tournament in Hackensack. 14.b4 Rxe3 15.Rxe3 Re8 16.b5 Na5 17.Ne5 Bxe5 18.dxe5 Ng8 19.Qa4 b6 20.Qd4 Be6 21.Bf6+ Nxf6 22.exf6+ Kh8 23.Bxg6 fxg6 24.f7#. In Saturday's game/60 Swiss at the Marshall Chess Club, I drew this game in the final round. 60.Rg6 Kd4 61.Kg4 Ke3 62.Rxg5 Rxg5+ 63.Kxg5 Kxf3 64.Kf5 Ke3 65.Ke5 Kf3 66.Kd5 Kf4 67.Kc5 Ke5 68.Kb5 Kd5 69.Kxa5 Kc5 70.Ka6 Kc6 71.a5 Kc7 72.Kb5 Kb7 73.a6+ Ka7 74.Ka5 Ka8 75.Kb6 Kb8 76.a7+ Ka8 77.Ka6, stalemate. 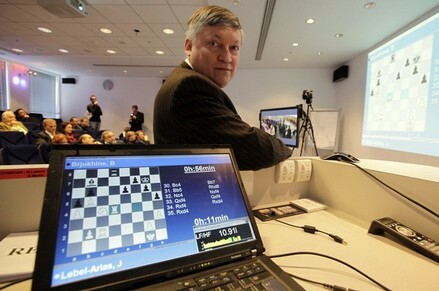 These are pictures taken by me during Sunday's grand prix event at Chess Mates. In round one, Roger Pedersen lost to IM Justin Sarkar. Meanwhile, Vladimir Polyakin and SM Yaacov Norowitz played to a draw. In round two, Gregory Rotsenmar was defeated by Roger Pedersen. IM Justin Sarkar and GM Michael Rohde drew their second round game. The fifth round game between IM Justin Sarkar and SM Yaacov Norowitz ended in a draw. 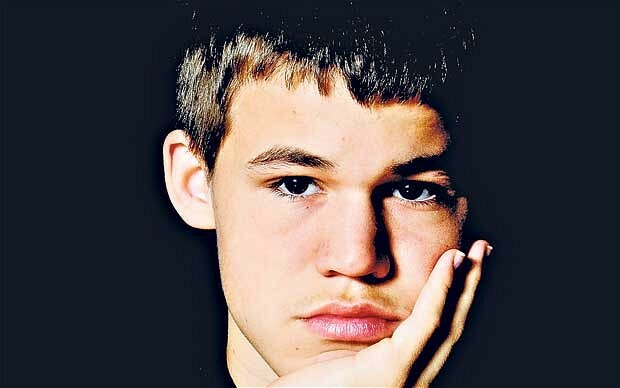 Carlsen Interview in "The Telegraph"
Magnus Carlsen describes his perfect weekend in The Telegraph. On Tuesday, a seniors chess tournament took place on the Internet as part of a scientific experiment to determine if intellectual activity can prevent Alzheimer's disease. Kasparov on Khodorkovsky in "WSJ"
Moazami - West @ "Contre Gambit Philidor"